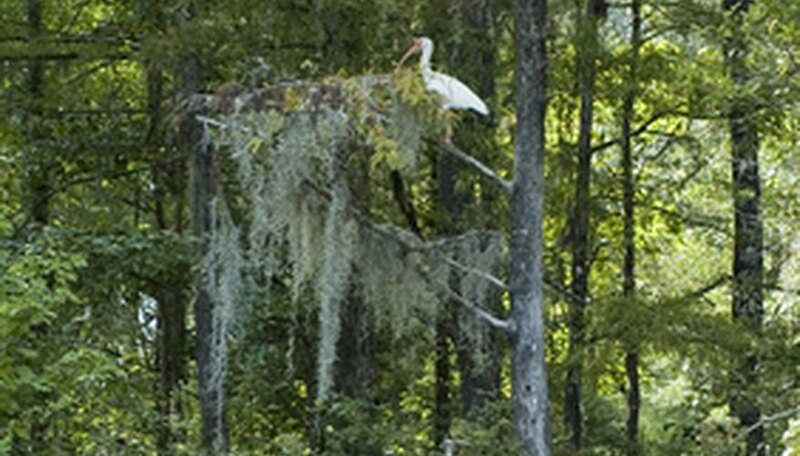 Spanish moss, also called Florida Moss and Grandfather’s Graybeard, is not parasitic. It is an epiphyte, an air-loving plant that happens to live on top of other plants. The main dangers it poses to trees are weight-related, because it becomes very heavy when it gets wet. If a tree has an overabundance of Spanish moss, that tree may also have its ability to photosynthesize severely restricted. It is also possible that you just may not like the way Spanish moss looks. In any case, you can get rid of it in a few different ways. Place a ladder next to the affected tree. Make sure it is secure and will not topple over. Climb the ladder and use a long pole with a hook to remove Spanish moss streamers manually. Discard or compost all moss you remove. Mix a solution of either copper sulfate and water, baking soda and water, or potassium bicarbonate and water in a bucket. Copper sulfate is often sold for this purpose, and should have directions as to concentration on the container. For baking soda and potassium bicarbonate, mix 1/4 cup per gallon of water. Pour your selected mixture into the sprayer. Use a funnel to guide the liquid if necessary. Spray the moss. You may need to spray it more than one time before the moss completely dies, particularly if you have a lot of it. While it is not commonly used in household materials today, some artisans and craftspeople still use dried Spanish moss in their arts and crafts. You may want to check local newspapers and classified websites to see if anyone is looking for Spanish moss. You may also want to take the initiative and list your newly removed moss as "free to a good home." Alternatively, you may even try to sell it for a modest fee, depending on what your local market will bear. If you are lucky, you may even be able to work out a Huck Finn solution, where you allow artists to take home as much Spanish moss as they can carry, so long as they first pull it out of your trees themselves. Copper sulfate can be dangerous to other plant life, particularly oak trees. Even if the Spanish moss you are trying to be rid of does not hang on an oak tree, sprays can easily travel. Be very careful if you choose to use this solution. You may want to try the comparatively benign remedies of baking soda or potassium bicarbonate first before bringing out "the big guns."